The Lakeside Park – Crestview Hills Police Department is planning a Citizens Police Academy. Citizens Police Academies have become a nationally proven method of developing an environment where the public can learn more about their local police department in an interesting and unique way. Since the instructors are the officers, the participants are afforded with the opportunity to get to know those officers, thereby fostering a healthy dialogue between the community and the police department. Participants will be afforded a distinctive opportunity to gain insight into the many different aspects of law enforcement. 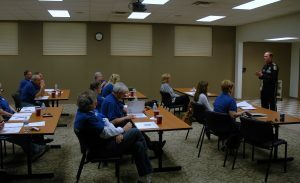 Our Citizens Police Academy is a five week program, consisting of meetings one night per week. These sessions will provide our residents the ability to gain first-hand knowledge of a variety of topics that encompass modern day policing. This is an excellent opportunity to learn about your local law enforcement. The Citizens Police Academy will be held at the Crestview Hills City Building. Residents must be at least 18 years old to apply. Those interested should contact the Lakeside Park-Crestview Hills Police Department at 331-5368 for more information or to obtain an application. You may also click the link below for an application. The class size is limited to 25 students and there is no fee to participate. Description: Instruction consist of one 2.5-hour class held each week. Certified law enforcement personnel with particular expertise will conduct each topic. All classes are free.